Boris Watchers has been set up to scrutinise the new Mayoralty of Boris Johnson. The blog aims to become a Wiki-style tool for constantly scrutinising the new administration in City Hall. We sure can't trust the Evening Standard to keep an eye on him! email me at gusbaker@gmail.com to get the password so you can help Watch BoJo! The Guardian report that "Hundreds of people will bid goodbye to drinking on the London underground with a subterranean cocktail party on the Circle line, following a viral campaign on Facebook." "a formal umbrella site has now been set up for the combined event, Last Orders on the Underground. One of the organisers, James Darling, 20, a web developer from Snaresbrook, east London, said: "I think it's going to be very interesting. I am not quite sure they can do anything about it. In Darling's party, the importance of good behaviour and respect has been impressed on attendees, as well as responsible drinking. Participants are also encouraged to turn up in formal attire. The event will be a 'gentrified affair'. He insisted he was not making a protest but "making the most of the current law while [we] still can". 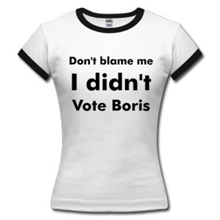 The introduction of the ban was "a very easy thing to do" for Johnson, said Darling,"
If you plan on going to the "normal" later party you might want to get in your order for the "Don't Blame Me, I Didn't Vote Boris" T shirt fairly quickly to make sure it arrives in time for the party. The password to this site has been made publicly available and thus I cannot be held responsible for entries posed. Contributors should note that all material, quotes etc must be sourced properly subject to deletion and password changing.